I made this homemade Lego cake for my nephew’s birthday. I used loaf pans with an entire box cake mix in each pan. I baked them at 315F for about 70 minutes. I built a 4-legged structure under the middle block that connects the two blocks, then I put 2 legs on that cross-plank up to another plank to hold the block that is perpendicular. In the end, the structure made it so that there is actually no cake that is sitting on another cake. That structure made the cake very solid. I stacked all the cakes onto the structure before I started decorating. The cakes were not perfectly square-angled rectangles. I was going to square them off, but the size of my nub materials forced me to leave them loaf-shaped. I was a little disappointed at the time of decoration, but I think it gave it a good character in the end. I put the small side of the loaf down on 3 of the 4 cakes, it definitely worked better that way. The nubs (I actually looked for the technical term, but Wikipedia did not have it, so I assume it is unknown) were made from double stuff Oreos. These were hard to ice. I would recommend a couple things. First, find a coated alternative if possible. The crumbs were annoying, as was the general rough texture of the cookies. Also, buy the white/yellow double stuffs for use with light colored icing–that would have made my coating mistakes not appear so large. That said, adding double stuff Oreos to a cake is a great idea. Delicious. I also coated some and put it on the base surface as if the blocks were on a larger Lego scene. I wanted to fill the base, but each nub took a while and I got careless with my green icing and it got too warm. Note to people early in their cake decorating experience: keep your icing as cold as you can, and take out only what you will be using in about 5 minutes. 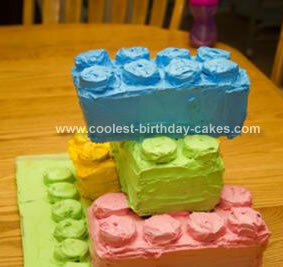 This homemade Lego cake turned out to be cool and fun. Added benefit, there was a built in excuse to have a large piece of cake, because you had to have at least on nub worth of cake! Birthday cake idea Posted by Matt V.